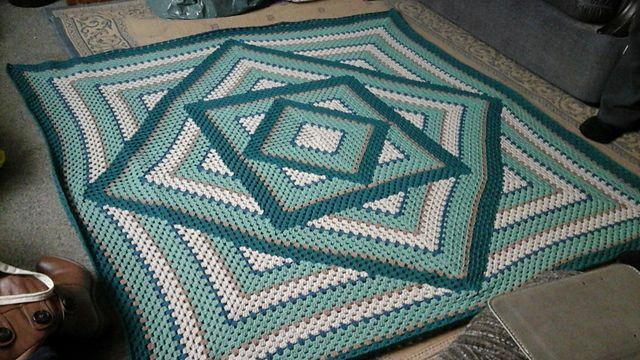 Hi friends, in this post we will learn another pattern of our incredible crochet, Prepared ... A very fun and 3D effect pattern that we can do in a simple and fast, all we want is not really. I always look forward to seeing how my work will end when I start something and I think they are all like that. We start the work wanting to finish and see the work we have done with our own hands which is the most rewarding for us who do the work, i always feel very happy with myself. Well just to my knowledge, I did a research on the name Crochet and I saw that the crochet has this name because part of it has the meaning of hook that is Croc, with that the word crochet was made through that French word that is the " croc ". This crochet craft technique has been well known in many countries since antiquity. But before it did not have as much material as it exists today but used what they could in place of the needle to do their jobs. Today we have many things in our disposition with different types and expirations of sizes as well as the yarns, we have different colors and expirations, we have in more detail in the wire or even several colors in a ball, being the yarn gradient. Today's pattern is about an amazing work that has a 3D effect that does not give a fantastic result. It has the name called Squared Diamond Granny, I've seen it with other names like kaleidoscope too, if in case I've seen it with that name is the same. This pattern is level of inciantes, if you know how to make the point of the pattern you will be able to do this work calmly without difficulty. That is why I say that we always have to train the main points, always, in order to achieve excellence in our points and thus to be able to do without difficulty after work. Practice always brings us to perfection, if you did not get any work do not give up, practice the main point and try again. It's all a matter of time and practice remember that. This technique can be used to make a quilt, a sofa blanket or an armchair, to make a square for something like a cushion. Using this pattern we can make and use as you wish. We always have this advantage that we can make a quilt of the size you want and change as you want at the time of manufacture. This pattern looks like a square within the other so forming this very modern pattern. 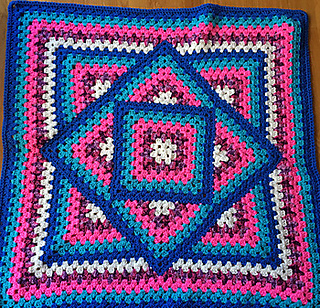 To make you can use as many colors as you want, you can make combinations that will look very beautiful you can be sure, just like I left in the photo this pattern with more than one color. Below is another photo of this pattern ready with other colors to give some more inspiration to you. Good for those who like it can access the link below that I left of that I found with the step by step with the information. I hope you enjoy it, good work and even the next incredible pattern. Follow our facebook page Xell Crafts.